Our 14U boys had a good day in Kingston today, winning Gold at their final tournament before provincials to make it three gold and two silver medals at their five 14U tournaments this season. The day started out slowly without much challenge in pool play and the semi-finals. But the final was a great match against Ottawa Fusion. The boys won the first set and were up 24-21 in the second but Fusions scraped out a win. Fusion was up 8-2 at the change in the tiebreaker but Attack came back strong and won eight points to go up 11-8, then traded points to win 15-12 (or thereabouts, its been a long day). Way to go boys! What a great finish as you head into Provincials and Nationals. Our 14U boys had another great tournament, adding a Silver medal to the two Golds they’ve won so far this season. On a very cold Saturday, January 30th, the players and spectators heated up the spacious four gym setting for the Challenge Cup, in Stouffville. Our boys came out strong, taking the first match in a fairly dominating fashion, winning 3 straights sets. After an hours rest, they continued their winning ways to complete the pool round with a 2 & 0 record, taking them into the quarter-finals against Markham Black. In relatively short order, Durham Attack took two sets, thereby seating them into a semi-final contest against the Storm Fury. This semi-final tested the skills of both teams and a win each brought about a third and deciding game. The spectators were treated to a very thrilling match, as both teams came up with their “A” game and neither one backed down for a moment, resulting in a very challenging, back and forth competition. Durham Attack prevailed with a final score of 21-19. The gold medal round saw a rematch with Pakmen. Yes, a big, talented team! It was a tough match and while our boys played their hearts out, on this day the gold medal went to Pakmen. While second place, and the silver medal, might not seem a victory – just ask our Canadian Juniors -our boys should have no regrets about their performance at this tournament. They now know the challenge is there and I have no doubt we will see strong play from all the players through the rest of the season. Congratulations on a fine performance. It is going to be a fun season! Its good to have a goal. Our guys now have their sights set on what they need to achieve to win at the next outing. Our 14u boys went on their first road trip of their club volleyball careers this past weekend. 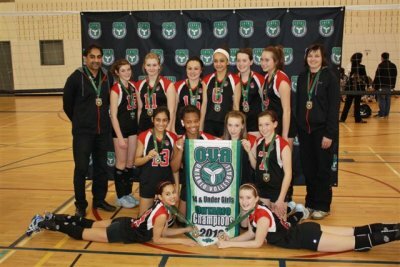 They travelled to Ottawa for a tough tournament, and they again emerged with the Gold medal, their second in two outings. It turned out to be a special weekend for the boys and their parents. Not only did they go on their first road trip together, which is so important for team bonding and development, but they also had a chance to meet our Prime Minister. Their gold medal match was watched by Prime Minister Stephen Harper and his wife Laureen, whose son plays on the Ottawa Fusion team that battled us in pool play and in the finals. As parents we relish the time we are able to spend with our kids, cheering them on, in the sports that they love. As we know the Harper family did today. With their busy schedules their time is extremely limited. So we truly appreciate the time that Prime Minister Harper spent with our boys after the match, getting to know them and taking some photos with our parents. And we wish the Ottawa Fusion team the best of luck in the future – they are a great team and we’re sure we will meet many times this season. 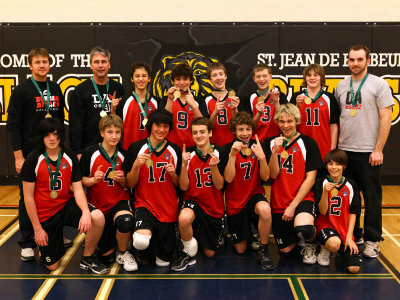 Our 14U boys started off the season with a bang, at the Provincial Cup in Woodbridge. With the triple-ball format the entire team rotates through the line-up, and each player sets when they arrive in position 2, so this was a huge win for the team, a true “total team effort”. Every player had a big part in this win. And what a facility, probably the nicest secondary school I’ve ever seen – St. Jean de Brebeuf. Along with volleyball they were hosting a swim meet in a big glass-walled pool area, doing what secondary schools here don’t seem to do as well – supporting the community. On to the volleyball. With a pool of three teams we played three 25 point sets against Vaughan Wolfpack (25-15, 25-11, 25-15) and Aurora Storm (25-17, 21-25, 25-21). Each was a full hour of play with a lot of quality touches for all the boys so it was great for development. Everyone set when in 2, everyone hit, everyone passed on serve receive. As it should be at this point in the season – no specialization. Coming first in our pool meant that we had a break until playoffs. Since we got a bye, it was quite a wait. IN FACT IS WAS A 5 1/2 HOUR WAIT, the longest I’ve ever endured in 5 years of volleyball. I don’t know what happened to the schedule, or how the boys endured it. When we started up again in the quarters it was like going to a new tournament. We had no idea if the same team, that won in the morning, would show up. Luckily the same team arrived to play and the boys cruised thru Pakmen 212 and Toronto West to gain a berth in the finals. And it was a great final, against a huge Pakmen team that had five big hitters that could jump through the roof. It was a great match, and loud, with both teams really getting into it, regardless of the triple ball format. I think we stunned Pakmen, who had had a relatively easy ride thus far that day, and scored at will, by taking the first set. Second set went to Pakmen. In the tie-breaker we took an early lead and kept pushing, winning 15-12. The OVA is accumulating some triple-ball video – here is some footage of the final. The guys looked great in their new DA jackets, with their gold medals. They represented our club with class. A huge thank you to our coaches Ryan, Michael and Brian, for taking the boys this far, at their first tournament. And to the most spirited set of parents in the gym! We played the controversial triple-ball format. Some coaches and parents embraced it. Others weren’t so happy. It almost seemed to depend on how the team fared. Our friends from Pakmen, who we faced in the finals, have a long legacy of developing great guys teams. And their coaches had the same goals as us early in the season, to develop all-around athletes. They loved the format, as did we. The two best-developed teams played for Gold. I spent the entire day working with Jason Trepanier, the Technical Director of the OVA, taking stats on how triple-ball was working out. Not to scoop Jason, who is publishing a blog tomorrow, but the stats were pretty dramatic. I took stats for 8 matches, about 20 games. We tracked the first contact on a server-introduced ball (ace, service error or pass), the second ball (volley by setter, bumpset by setter, volley or bumpset by non-designated setter, or no contact) and the third ball (attack attempt, freeball attempt, or no contact). And we tracked similar statistics for the coach-introduced balls, plus the number of rallies. Take a look at Jason’s blog on the OVA web site to see what we found. 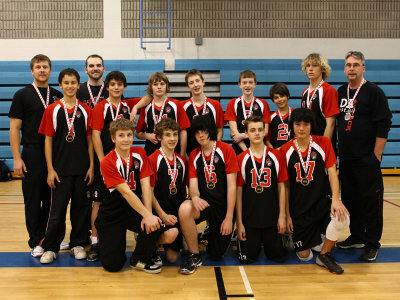 Our 14U boys team had a good first tournament at the KW Predators 14U Invitational in Kitchener this past weekend. 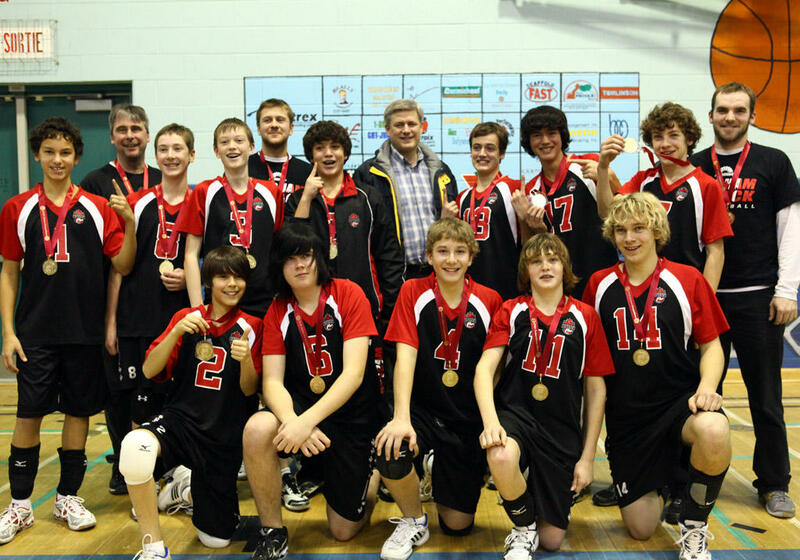 For many it was their first taste of club volleyball, the coaches had a chance to see the boys in action and to size up the competition, and the boys came away with a bronze medal. Though a medal was not their stated goal. Our coaches’ definition of ‘success’ for this tournament was to play players evenly, to not specialize positions, and to maximize the development of their athletes. We wanted to be the best defensive team at the tournament. In other words a medal is not important at this point in the season, especially at a non-OVA tournament, and this was a good opportunity to develop the guys. And they did exactly that. While every other team ran a 5-1 and played their ‘starters’ when it mattered, we rotated all our players through all the sets, and whomever happened to be in position 2 was the setter. Every player played every position. And still we came away with the bronze medal, and actually beat the winning Niagara Rapids team the first set of the semis (in reality, if not on the scoresheets, due to a scorekeeping error that even the refs agreed with). No matter, our goal was accomplished. The boys are on track for a great season, and with a very supportive group of parents it’s going to be a lot of fun. Watch this team – they are going places.